Professor Clarissa J. Nobile of the University of California, Merced, is one of 22 researchers named today as a Pew Biomedical Scholar for her work exploring how communities of microbes conspire to cause disease. 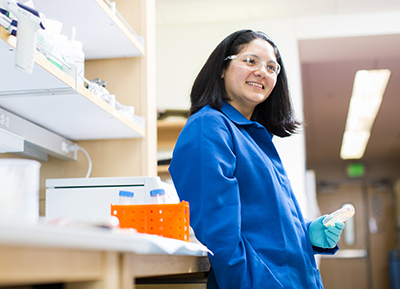 Nobile is the first UC Merced researcher to win a Pew scholar award, and she joins the more than 600 scientists who have been selected as Pew scholars in the 30 years since the program’s inception. The program provides four years of funding to early-career scholars dedicated to pursing high-risk, high-reward research that can lead to extraordinary discoveries in biology. The prestigious award will help fund Nobile’s groundbreaking research in the growing field of biofilms, microbial communities that can develop in the human body or in nature and which are notoriously resistant to antimicrobial treatments. In what is a relatively new field of research, Nobile is on the cutting edge. Infections are often treated by targeting individual bacteria or fungi, as if they act in isolation. But these microorganisms are part of complex microbial ecosystems that scientists are only beginning to understand. Nobile’s work studies infections from the ecosystem context, rather than the individual microbe. Using an array of genetic, biochemical, microbiological and sequencing techniques, Nobile’s lab is beginning to map the interactions between several interacting microbial species prevalent in humans. 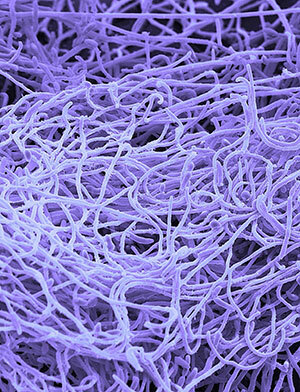 By identifying how microbes influence the gene activity of partner species and the molecules they use to communicate, Nobile hopes to change the way scientists look at microbial interactions and create better ways to combat infectious disease. She is also the co-founder of a startup company, BioSynesis Inc., whose mission is to develop diagnostics and therapeutics to treat biofilm infections. For Nobile, who earned her Ph.D. at Columbia University in 2007 and was a postdoctoral researcher at UC San Francisco before arriving at UC Merced in 2014, the Pew award is the highest recognition of her young career. UC Merced has provided an ideal place for Nobile to continue her research program. The university boasts a strong group of faculty members studying pathogens and their hosts, and the campus’s interdisciplinary spirit has made it easy to collaborate with researchers in fields like applied mathematics and environmental sciences. In addition to her work on biofilm infections in humans, Nobile is taking advantage of UC Merced’s location and her colleagues’ environmental research strengths to study the formation of biofilms in groundwater wells in the Central Valley. Biofilms that form in groundwater wells, a process known as biofouling, can cause wells to clog.